Clarke & Severn Electronics presents Mini-Circuits PWR-4RMS power sensors, a range of true RMS power sensors that turns almost any PC into a smart power meter for modulated waveforms. The Mini-Circuits PWR-4RMS smart power sensor is a pocket-sized, precision test USB HID device measuring 12.4 x 4.4 x 2.4cm compatible with 32/64 bit operating systems, and capable of turning a Windows or Linux PC into a true RMS power meter. 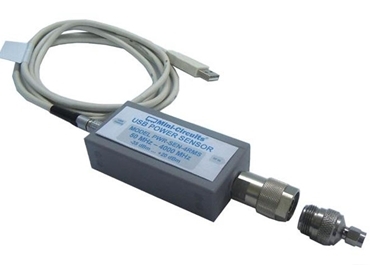 The USB power sensors provide highly accurate measurements of CW, modulated and multi tone signals providing plug-and-play measurement capability for a wide variety of applications including testing 3G and 4G products, cell phones and general RF components such as couplers, filters and amplifiers, and display numerical data and graphs. The PWR-4RMS measures signals employing advanced modulation schemes such as QPSK, 256 QAM, MSK, and DQPSK in LTE, DECT, GSM, PWT and other systems. Mini-Circuits PWR-4RMS smart power sensors do not require any reference signal for calibration. Each power sensor is provided with the N-to-SMA adapter and a quick-locking USB cable for reliable connectivity.